Tries from Israel Folau and Chris Feauai-Sautia either side of half-time were enough as Australia held off a spirited Scotland side to record a 21-15 win at Murrayfield. The Dark Blues had been embarrassed last week by South Africa but did themselves no disgrace as they lost out to the Wallabies. Christian Leali'ifano added 11 points with the boot but failed to add a real gloss to the scoreline as he missed five penalties and a conversion. Scotland's performance was much improved from their humiliating 28-0 defeat to South Africa last time out but they will be kicking themselves after failing to punish an Australia side who had lock Rob Simmonds sent to the bin at a crucial point in the second half. Greig Laidlaw struck five penalties himself as they came within a converted score of an upset but Scott Johnson's team still lack the killer instinct needed to threaten the major nations. Scotland's head coach had tried to put a brave face on his side's 28-0 Springboks humiliation by insisting there were as many positives as there were negatives from Sunday's drubbing. But that was nonsensical for anyone who saw the world's number two ranked side run rings round a hapless Dark Blues pack. Johnson obviously hoped for a more robust display from his forwards as he made four changes, bringing in Ryan Grant, Grant Gilchrist, Johnnie Beattie and skipper Kelly Brown while also replacing Ruaridh Jackson - the fly-half responsible for two of the Boks' tries - with his Glasgow team-mate Duncan Weir. However, the Wallabies had hardly had the perfect build-up either. They may have beaten Ireland 32-15 in Dublin last Saturday but coach Ewen McKenzie was forced to hand out one-match bans to six of his players after they were involved in a late-night drinking session ahead of that victory at the Aviva Stadium. The game was barely a minute old when wing Leali'ifano kicked the visitors ahead after Jim Hamilton started his 50th game for Scotland by immediately wandering offside. But the scores were soon level as Laidlaw - who did not even have so much as a look at the posts against the South Africans - slotted over his own penalty. The Scots failed entirely as an offensive unit last weekend but within the first 10 minutes of this encounter they had proved they were at least a match for the Wallabies, coming up just short of the line following two explosive line breaks by Hamilton before Laidlaw took another easy penalty to put his side ahead 6-3. Leali'ifano came up short with his next effort at the posts while Weir did likewise after Wallabies fly-half Quade Cooper was penalised for slamming into his cousin Sean Maitland, playing full-back for the Scots. Leali'ifano levelled the match once again soon after with another penalty, with the home side forced into an early change as Ross Ford limped off to be replaced by Pat MacArthur. The Scots knew all about the Wallabies expansive running game but failed to heed the warning as Cooper and Falou combined off a line-out to send the latter sprinting in behind the Scots for the opening score on 27 minutes.Leali'ifano added the extras but the gap was soon closed to four points as Laidlaw stuck over his third penalty. The Scots' scrum-half then delighted the Murrayfield support with another successful kick but the noise of that cheer was nothing to match the groan that followed Sean Lamont's failure to get the ball over the line in the corner just before the break. Scotland went in at the interval just a point behind but were caught cold just three minutes into the second period as another swift exchange saw Australia work it through their back division before Feauai-Sautia held off last-ditch tackles by Maitland and Nick De Luca to score in the corner. 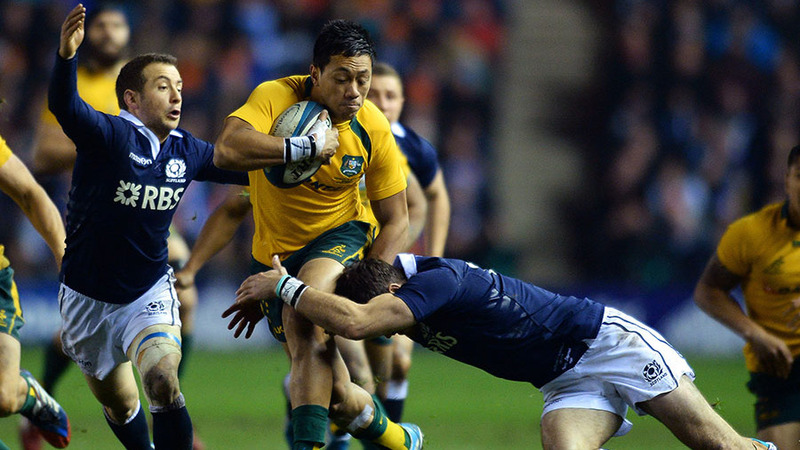 But the good news for Scotland was Leali'ifano missed the conversion and the Wallabies were soon down to 14 men as Simmons was sin-binned for aiming a punch at home prop Moray Low. That act of stupidity saw Laidlaw close the gap with another penalty but Leali'ifano kicked his next attempt from wide on the left to push the Aussies back into a six-point lead once more. From that point, however, Leali'ifano's kicking game fell to pieces. He could have put clear day-light between the teams but missed two simple attempts with the boot. Brown was caught offside late on but Leali'ifano missed yet again and the hosts sensed the opportunity to grab a shock late winner. But try as the might, the Dark Blues just did not have the guile or ingenuity to fashion the necessary breakthrough as they slumped to their seventh defeat of 2013.